The space agency has opened itself up to an eternity of Star Trek references. 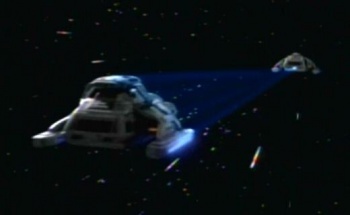 Though they aren't being designed with the pulling of spacecraft in mind, NASA has announced its intention to explore three different kinds of tractor beam tech over the next few years. The project, led by people with a variety of extremely impressive-sounding job titles, aims to build machines capable of capturing small space-particles for research via laser beams. Funded by the NASA Office of the Chief Techonologist and led by the Principal Investigator, the research team will investigate three different tractor beams with an aim to employing at least one of them in the collection of particles in space. Since this is fairly new science, the team will test three different methods before selecting the most efficient. Detailed descriptions of the three methods (including words like "solanoid," "optical vortex," and "Bessel beam,") can be found here. "Though a mainstay in science fiction, and Star Trek in particular, laser-based trapping isn't fanciful or beyond current technological know-how," said Principal Investigator Paul Stysley. "The original thought was that we could use tractor beams for cleaning up orbital debris, but to pull something that huge would be almost impossible -- at least now," he continued. His colleague Barry Coyle added: "We want to make sure we thoroughly understand these methods. We have hope that one of these will work for our purposes. We're at the starting gate on this. This is a new application that no one has claimed yet." It's exciting to think about what discoveries may lie ahead of this team as they head deeper into the practical applications of tractor beams. While it would be silly to start suggesting spaceships out loud, small-scale tractor beams could find many uses in space outwith the realm of particle collection (the poor astronaut who set that inordinately expensive tool bag adrift in the cosmos a few years ago could probably help think of a few). There are also terrestrial applications to consider, such as whether any of these beams could pull my phone across the room towards me or not. Whether or not any of us will be alive to see the day these things happen remains to be seen, but at least we get to tell people we were there when it started, right?